Easter is over and there’s a good possibility many of you have quite a bit of leftover ham at your house. 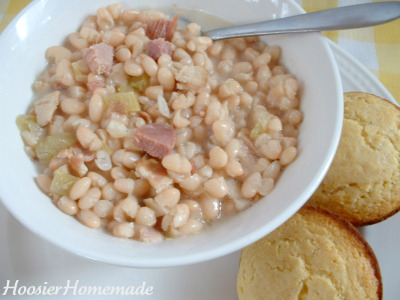 is sharing some delicious recipes today for using up your leftover ham. The holidays are a great time to buy the meat when it’s on sale. I bought a ham at Aldi last week for $0.99 per pound. It cost me $8.37, and we got 5 meals out of it. Although we love Scalloped Potatoes and Ham, we were a little tired of it, so I came up with some new recipes to make using our leftover ham. Bring ham bone to boil in water. Add salt, pepper, celery and bay leaves, reduce and simmer for 1-2 hours. (You can use plain water, but I wanted the soup to have some more flavor.) Strain broth, add to crockpot. To prepare beans, soak overnight or for a quick soak, bring 6-8 cups water to boil, add beans and boil for 2 minutes, remove from heat, cover and let stand for 1 hour. Drain and rinse, add the crockpot. Cook bacon for a few minutes, then add chopped onion, saute until golden brown and bacon is done, but not crisp. Remove from pan and chop, add to crockpot. Add ham to crockpot, if desired. Cook on low in the crockpot for 8-10 hours or on high for 5-6 hours. Add heavy cream, and continue to cook about 15 minutes more. Remove bay leaves. Cook Tortellini in boiling water according to directions on package. Add broccoli to the boiling water for about 3 minutes. Meanwhile, cut ham and shred carrots. Drain and rinse beans, drain and rinse tortellini and broccoli. Toss all ingredients with dressing, refrigerate 1-2 hours. Note: You can easily leave out the beans or substitute veggies that you and your family likes. This salad is great as a side dish, but hearty enough to serve with a good bread for dinner. Preheat oven to 375 degrees, place pie crust in baking dish. Layer the ham, cheese and broccoli. In a separate bowl, beat the eggs and milk, then stir in remaining ingredients. Pour over broccoli. Bake for 30-45 minutes or until knife inserted in center, comes out clean. Let stand 5-10 minutes. What are your favorite ways to use up leftover ham? Liz is a SAHM of 3 teenage boys and happily married for 20+ years. She shares lots of homemaking tips including her love for baking, cooking and decorating on . She hosts the Cupcake Tuesday blog carnival with lots of . « Clear Out the Clutter Challenge: Who’s With Me? Thank you! 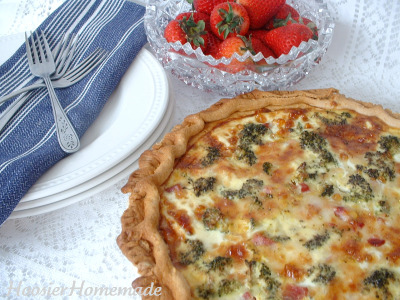 I was blessed to get some ham from our family dinner and will be using your quiche recipe! I think I will make it in mini muffin tins so I can freeze and heat up for the kiddos. We also love ham in our breakfast burritos! Ham and broccoli pizza, omitting tomato sauce and brushing the crust with olive oil and lemon juice. Mmm. Ham risotto, using chicken broth, onions, arborio rice, and chopped ham. Serve with cheddar and fresh diced tomatoes to sprinkle on top. I like taking ham and making a breakfast quiche with it. You can mix and match whatever you family likes. Thanks for having my Crystal! It’s an honor! That quiche looks really yummy! I might have to look for a ham on sale when I hit Wal-Mart today. Scalloped potatoes and ham is always tasty too, thanks for the ideas! we have a bunch of ham leftover glad to see all the ideas-anyone know if ham previously frozen can be re frozen? I love to cook by the seat of my pants. This is something I came up with years ago to use up ham steaks. I boil a pound of egg noodles. Add a can of cream soup, about 2 cups shredded cheddar (or whatever flavor!) cheese, cubed ham and a little milk (maybe 1/2 c.). Bake at 350 for about 30 minutes. This is a wonderful comfort food! Hot pockets, with ham, mozzarella cheese, pizza sauce, and canned pineapple tidbits. Bean soup….yum…and so easy in the crockpot. Onion, 30 oz. diced tomatoes, dried beans (I use a 13-bean mix), ham bone with meat on it, some water, salt (if needed), pepper, garlic, and a little lemon juice or vinegar. Anything with eggs and ham. Scrambled, quiche, omelet, etc. Macaroni and cheese with ham and peas. And maybe I’ll just chop some ham up and freeze in Ziplocks for easy meals in the future. We don’t have ham very often, because it’s not especially nutritious, but when we do have leftovers, they go a long way, and they’re always yummy. Ham fried rice is amazing, and good for using up those “bits” of ham. I second the ham fried rice. We had that for lunch today! Rice, ham, peas, green onions, soy sauce, eggs. Easy, easy, and so yummy. @Michelle, How do you make it? Thanks! I heat sesame oil (if I have it or olive oil otherwise) in a wok skillet. To that I add frozen peas (1/2 cup) and chopped green onion (1/4 cup). Cook for 3 minutes or so, add rice (1 1/4 cup) and cooked, chopped ham (1/2 cup) and cook a few more minutes. Then make a hole in the middle of the skillet by pushing the rice mixture up the sides of the skillet. Add one egg and stir tell set, slowly mixing it in the rice. Add soy sauce to taste and enjoy! I use left over rice and generally double or triple the recipe. We eat it up and it’s good left over too. We love this recipe, its great the first night, and even better the next day. We make a hash skillet (instead of corned beef we use ham with potatoes and eggs). We love breakfast for dinner. We have a favorite at our house with leftover ham that may sound a little weird, BUT it is so good! All you do is put some cooked spaghetti noodles in everyone’s bowl and then put on a scoop of cottage cheese and top it all off with some ham gravy that you have made with ham, milk, butter, flour and salt and pepper. I will be making it this week–yummy! Since we ate TONS of ham and bean soup over the winter, we’ll be trying other recipes. We also have a son with an egg allergy, so all the quiche and omelet recipes are out for us. We’re planning: Ham and pineapple pizza, Ham biscuits, toasted subs, ham and potato hash. I also like tossing diced ham into mac n cheese for a quick lunch. I LOVE to make a good pot of vegetable soup with my leftover ham. You can follow any recipe for vegetable soup and use the ham instead of beef and it gives it a whole new flavor! I’ve always hated most vegetables and this is one of the ways I can eat them without gagging!! put in a 9×13 pan with some cheese sprinkled on top (parmersean was always a favorite) for about 20 minutes – 30 minutes. Voila. Serve with a light salad. On biscuits, with white cheddar and apricot mustard. A Dean & Deluca combo that still knocks my socks off! 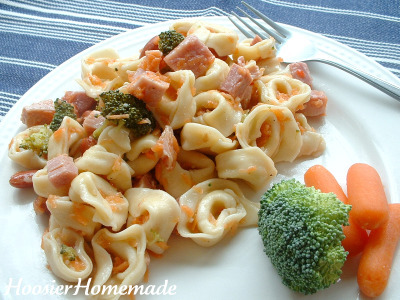 I plan on making grilled ham and cheese sandwiches with Dijon mustard for extra punch, but that recipe for Tortellini Bean and Ham Salad looks so good I may have to make that too! Here’s a link to some of my recipes! We make Ham Pot Pie. It is an old Pennsylvania Dutch recipe. It is not really like a pot pie with a pie crust but more like a thick stew with noodle like dumpling squares. Potato and Ham soup!!! I made this for the first time after Christmas to use up some of our leftover ham. My husband and son are not big fans of potato soup, but they both devoured this soup. Delicious!! We are not big fans of soup once it gets warmer like it is here, but some of the other recipes sound delish. I’d love to hear suggestions for “cooler” foods to serve as the weather gets warm. For example, I’m trying to find a chilled pasta salad recipe to use up some ham. Also I think I’ll try deviled ham if I can borrow a food processor. Seems like I’ve seen deviled eggs with ham in them too. And some of the other mentioned recipes can be prepared without turning on the oven, like sandwiches on a panini press or pizza on the grill. We love dicing leftover ham and using it in omlettes or on homemade pizza! Yum! It’s easy and it’s a great OAMC, freezer meal. I made that Cheesy Potato Casserole (Cr. of Celery soup, hash brown potatoes, cheese, sour cream…) tonight and added cubed up ham and wow! That was delicious. tonight for dinner, i made pasta with plain ‘ol tomato basil spaghetti sauce and added spinach, mushrooms and chopped up ham. it was kinda like having pancetta in the pasta! i made sure to brown the mushrooms and ham and spinach before adding to the sauce. I usually always have potatoes on hand so I LOVE this soup (Potato and Ham!). So easy and nummy! Whenever I buy a ham, I always freeze the leftovers in portions so I can make Ham and Potato Soup. Even my picky husband (who doesn’t like soup) likes it. He says it’s restaurant quality.